Rufous Whistlers are the most common and wide-ranging of all the whistlers in Australia - they occur virtually all over the continent except in rain forests, some of our more arid deserts and the far SW of Victoria. 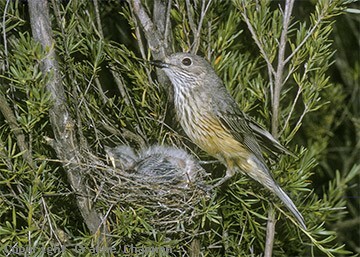 Once adult, in many areas they are fairly sedentary, the same birds pairing together in the same territories year after year, but in SE Australia at least, some birds undergo seasonal movements as well. Unlike Golden Whistlers which have made it to most of our outlying islands such as Norfolk, Lord Howe, Tasmania and Kangaroo Island, Rufous Whistlers don't occur in any of these places but further away, they are found in New Caledonia. Clearly they are not long-distance migrants in fact they could be termed landlubbers! 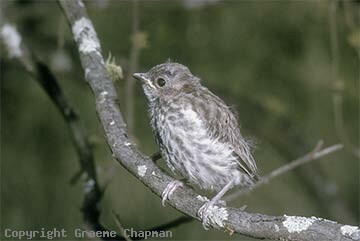 There are only three subspecies, the most distinctive of these is a pale form which inhabits Cape York. Males don't generally acquire adult plumage until their third year (see pic 415213 for a bird in moult). Females and immatures are very similar in appearance (see pics 401214 and 401215), a pale base to the bill is a good indicator of immaturity. Rufous Whistlers (mainly the males) have a distinctive display which has been termed bowing or bobbing. 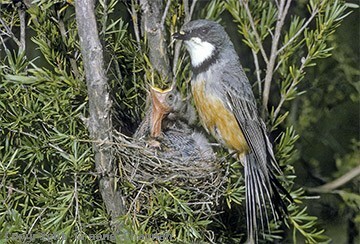 It is used both in courtship and also territorial defence when they have a dispute with their neighbour. The bird starts by puffing out the breast, holding the head back and pointing upwards, erecting and fanning the tail and partly spreading and lowering the wings. It then proceeds to bow up and down in exaggerated fashion, all the while singing loudly. Picture 401206 shows a male beginning bowing display. Rufous Whistlers are one of our most accomplished songsters. (Listen on sound page). 401201 ... Rufous Whistler, male. 401202 ... Rufous Whistler, female. 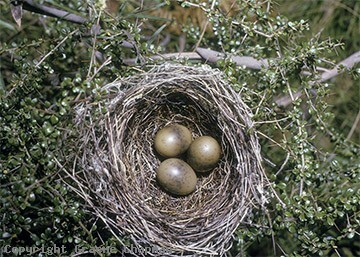 401203 ... Rufous Whistler nest and eggs. 401204 ... Rufous Whistler, fledgling.